Clean eating is perhaps one of the most prevailing diet trends in the world of health and fitness and it is here to stay. Ask any fitness or sports enthusiast they will most likely credit ‘clean eating’ for their physique and performance levels. And the cult of “clean eating” is more popular than ever these days. ‘Clean Eating’ presents itself on the opposite end of ‘IIFYM’ spectrums. While the ‘IIFYM’ (If it fits your macros) folks preach that you can eat anything that fits your macronutrient goals. ‘Clean eaters’ don’t emphasize the quantity but the quality of food. They advocate that only ‘clean foods’ must be consumed throughout the day. Nonetheless, the term ‘clean foods’ is very vague and subjective in itself. For a Ketogenic dieter this will mean meat, nuts and cheese, for a vegan, plants and seeds, and for Paleo dieter, the list is limited to Paleo-approved foods. In this article, we will we break down everything you should know about clean eating and also provide a sample clean Indian diet. The ideology of clean eating traces back to the ancient period, the Greek physician Hippocrates did one of the first works on dietary principles and quoted “Let food by the medicine and medicine be thy food”. Is it better than IIFYM? Like mentioned earlier ‘Clean eating’ ideology is the opposite of IIFYM. While you are allowed to consume anything and everything that fits your macro-goals in IIFYM, you are limited to natural whole foods in ‘Clean eating’. This has certain advantage and disadvantage when compared to a flexible diet like IIFYM. Since you have a rigid plan (as in most clean diets), you are less likely to deviate from it and inevitably make better progress. It is not uncommon for dieters on a flexible diet to misinterpret calories of food and hamper their progress. A structured plan and inclusion of primarily whole foods in a clean eating diet makes it easier to follow and enhances satiety rate. However, the limited food choices can create monotony and make adherence a challenge. In a nutshell, clean eating is good for initial stages of a diet when an individual is learning about calorie tracking and developing structured nutrition habits. Once, a certain degree of nutrition excellence has been achieved a more flexible diet approach can be implemented. It is said “You are, what you eat” Perhaps one of the most notable advantages of following a clean diet is improved skin and hair quality. Processed/Junk foods contain artificial flavourings, colours and hydrogenated oils which tends to promote skin acne and oiliness. 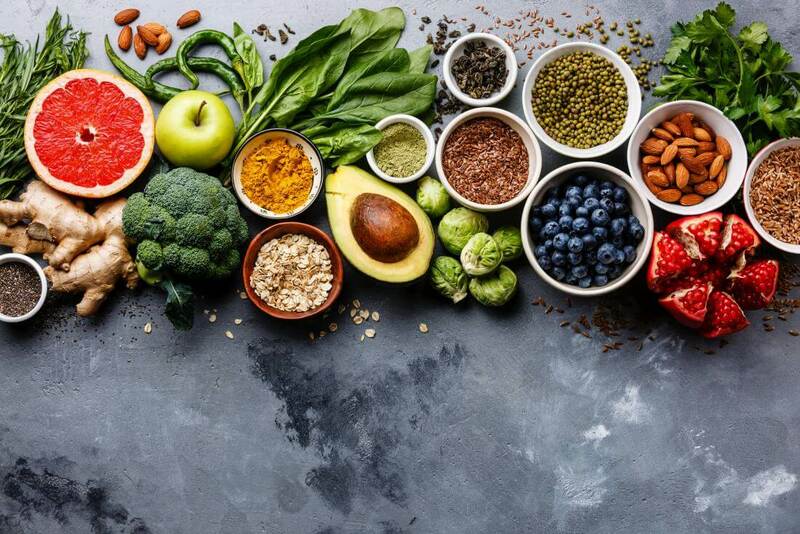 A diet rich in whole foods provides the body with not just macronutrients but also all the essential micronutrients and antioxidants such as Vitamin B’s A, C and E which are good for skin and hair health. In addition to nutrients like potassium, vitamin C and folate, a clean diet (given it has plenty of fruits and vegetables) is an also high in fibre. Fibre has the potential to reduce constipation, enhance digestion and lower the risk of heart disease and diabetes. Consuming a full spectrum of vitamins and minerals via whole foods ensures optimal body functions which enhances immunity. Studies have noted that people whose diet are rich in whole grains, fruits and vegetables fall sick notably less than people whole majorly consume processed foods. This isn’t due to what they are eating but what the food is composed of. What can it not do for you? Clean eating philosophy doesn’t account for one vital factor i.e. food quantity. And this has led to a common misconception among people that if they start eating ‘clean foods’ they will achieve their fitness goals. But whether your goal is fat loss or muscle building the most important consideration is the caloric quantity. Although, clean eating has numerous health benefits as we discussed before, merely eating clean foods cannot make you lean or muscular. The patients were fed a liquid formula diet (we can call it clean!) containing the same number of calories per day – either 800, 850, or 1200 (as per the patient) for ten weeks. Therefore, if someone (hypothetically) consumes 10 Kg of carrots every day he/she will be in taking 4100 calories per day which is be a lot for most human beings and inevitably make him/her fat. Hence, it’s not just what you eat but how much you eat is what matters. If you have additional muscle building or performance goals you have to quantify the composition of food as well. Now that we have a firm idea of what clean eating is, its pros and cons. We can make some general recommendations for taking advantage of this eating style. Nuts are rich in unsaturated fats, vitamin E and L-arginine. Also being high in fats which tends to digest slowly it provides good satiety. People on a weight loss program may consume one serving a day and for weight gain goals two servings a day. Fruits are rich in micronutrients which are essential for optimal functioning of the human body. If you consider macronutrients as fuel, consider micronutrients as engine oil. People on a weight loss program may consume one serving a day and for weight gain goals two servings a day. Apart from being a good source of many vitamins (such as vitamins A, C, and K and folate) and minerals (such as iron and calcium), they are also rich in antioxidants, which tackles the free radicals which can damage your body. Also, vegetables are high in fibre with a negligible amount of calories making them great for filling the stomach and keeping the gut healthy. For people on a caloric deficit consuming fibrous vegetables with each meal can curb hunger levels. Grains are a great source of many nutrients, which includes fibre, B vitamins (thiamin, riboflavin, niacin and folate) and minerals (iron, magnesium and selenium). Consuming whole grains regularly have shown to reduce the risk of certain chronic diseases. Hence, rotis, legumes, pulses, lentils and oats should be the primary source of carbohydrates in your diet. Protein is your number ally if your goal is to enhance body composition. Protein is broken down into amino acids in the body which helps in building new muscle tissues and recovering from strength training. For fitness goals aim for 2-2.2g protein per Kg body weight. Even if your goal is not to build muscles and just stay healthy, aim for at least 1.2g protein per kg body weight as the role of protein is not limited to muscle building. Protein is essential for certain critical roles in the body such as the production of hormones and secretion of enzymes. Keeping track of how much you are eating. As stated above that just eating clean foods can also result in weight gain if the amount of food isn’t gauged. We recommend a simple technique for quantifying your food. This technique was developed by the Precision Nutrition experts which uses your hands as measuring tool. It is convenient plus personalized- the bigger you are, the bigger your hand, and consequently more food you would get to have. Vise-Versa for smaller individuals. For protein-dense foods like meat, fish, eggs, dairy, or beans, use a palm-sized serving. Note: a palm-sized portion is the same thickness and diameter as your palm. For vegetables like spinach, green beans, kale, broccoli etc. use a fist-sized serving. For men- 2 fist-sized portions of vegetables with each meal. For women- 1 fist-sized portions of vegetables with each meal. For fat-dense foods – like oils, butter, nut butter, nuts use your entire thumb to determine your serving size. For men- 2 thumb-sized portions of fats with most meals. For women- 1 thumb-sized portion of fats with most meals. To determine the portion of carbohydrate-rich foods such as grains, bread, rice, fruits use a cupped hand serving. For men- 2 cupped-hand sized portions of carbohydrates with most meals. For women- 1 cupped-hand sized portions of carbohydrates with most meals. If you apply these principles to 70% of your food intake. Your health will be dramatically enhanced in just a few weeks. Take your multivitamin and multimineral and vitamin D (2,000-5,000IU) with this meal.